We’d love your help. Let us know what’s wrong with this preview of The Stonemason by Cormac McCarthy. The setting is Louisville, Kentucky, in the 1970s. The Telfairs are stonemasons and have been for generations. Ben Telfair has given up his educatio From a writer hailed as an American original -- and the author of the national bestsellers All the Pretty Horses and The Crossing -- comes a taut, expansively imagined drama about four generations of an African American family. To ask other readers questions about The Stonemason, please sign up. I won't apologize for giving another 5 star rating to the most important author for me. It may not have been his longest or most profound (or maybe it was), but it is certainly well above all those other books that I rated at this level. My mind is rampaging about how to write my little, amateur review. This book even got me asking why I push these reviews out on this (likely) ephemeral electronic site, where most readers are people I haven't met, nor people I personally know and love. Perhaps a I won't apologize for giving another 5 star rating to the most important author for me. It may not have been his longest or most profound (or maybe it was), but it is certainly well above all those other books that I rated at this level. My mind is rampaging about how to write my little, amateur review. This book even got me asking why I push these reviews out on this (likely) ephemeral electronic site, where most readers are people I haven't met, nor people I personally know and love. Perhaps a brother or daughter or cousin or even my wife will take a look sometime, so they are also amongst the virtual audience. I don't blog, I keep it close to the vest on social media, so my review might be one of the few "public" airings. Books are emotional for me, they challenge and comfort me, and one might even say my life is defined by the intervals by which they are read and how they coincide with life events and stages of my spiritual, social, intellectual and physical development. I need the space of a few hours today, with some snow gently falling, around the hearth, dealing with some minor family sadness of our own... to write a little summary & tuck it away in the physical space of the book before returning it my basement library, perhaps never to be opened or read again. As an aside, I did carefully razor/peel and de-gum the dust cover of this hardcopy (I don't read much other than paperbooks). It is a fetish of mine to remove the re-sale stickers and associated detritus from those that I read, and this one turned out nicely. An original edition, untarnished by a flashy cover or other advertisement, without forward, without any of the barking silliness that marketers use to line their pockets. Several personal aspects come together for me in this book, or perhaps as I move beyond middle age these are my tendencies. I shall try to avoid overindulge here. Cormac and I have probably both read the King James version to an excessive degree, me in church trying to stay entertained with the only allowed diversion, while some preacher (not all, but some) belabored the obvious. This book has expansive and deep spiritual dimensions, most certainly biblical in theme, tone and style. First of all, the location is Louisville Kentucky, a place a lived for 5 years, long after the date when this is set (1971). It is a play, a genre I rarely read, but I have loved this author’s others (e.g. The Sunset Limited), with 4 generations of a black family living together under the same roof. A theme is the relationships amongst the men of the family, where the 30-something protagonist, Ben, worships his grandfather (PawPaw), endures his father (Big Ben) and tries to father his nephew (Soldier). The other theme is craft (stonemasonry) which, I realize, is metaphorical for McCarthy’s own life’s work, writing novels. The final scene, when Ben confronts his dead grandfather, was poignant for me as I had a dream recently (which I must capture here before it fades) of greeting on equal terms a young version of my own grandfather (whom I idolized) as a young, handsome, black-haired man with his shirt sleeves rolled to the elbows, looking fit and happy. The secret language and special mystery of knowledge transmuted in words and actions, and inactions or quietude, is what Ben receives from PawPaw (and I received as well, from my own PaPa, a farmer on his farm, in moments of purity with one of the finest human beings I have ever known). What else? I calculated (with help from Alexa) that Cormac was 60 when this was published (1994). Assuming a 3 year window from creation to publishing (my estimated), he was about 57-58 when this was likely written. I’m 57 and turn 58 in 3 days. So he wrote this at my age. Author to reader, one white guy talking and another listening, both struggling with the same kind of questions. There is tragedy in this book, as McCarthy always tackles the biggest themes on man’s stage, but mostly this story is about the pride, comfort and (even) folly of a man falling in love with his principles, in this case for workmanship. His worship of his benefactor, PawPaw, comes with some risk as he ultimately realizes that love, or “charity” as its known in the KJV, requires an act of faith. This story ends hopefully, as I am still hopeful at a ripening age, and it resonated with perfect pitch. But I am still holding back “The Road”, until just the perfect time (or when I’m strong enough). p. 32 where PawPaw dispenses wisdom to Ben, his Grandson, about the family farm and the white people who live there: “He had me promise not to disturb the pale renters interred on our farm but I had no intention to do so. He says that for himself we can just throw him out in a sinkhole when he quits this world. But he’ll be buried with his ancestors black and white in full possession of the earth whereunder he lies. It balances out, he says. Yes. The arc of the moral universe is indeed long but it does bend to ward justice. At the root of all this of course is the trade. As he always calls it. His craft is the oldest there is. Among man’s gifts it is older than fire and in the end he is the final steward, the final custodian. When the last gimcrack has swallowed up its last pale creator he will be out there, preferring the sun, trying the temper of his trowel. Placing stone on stone in accordance with the laws of God. The trade was all they had, the old masons. They understood it both in its utility and in its secret nature. We couldn’t read nor write, he says. But it was not in any book. We kept it close to our hearts. We kept it close to our hearts and it was like a power and we knew it would not fail us. We knew that it was a thing that if we had it they could not take it from us and it would stand by us and not fail us. Not ever fail us.” You may notice the “arc of the universe…” quote, which was used by Obama, quoting MLK, taken from the transcendentalist Theodore Parker in 1853 (yes, I googled that). p. 91, it hit me, like a diamond between the eyes, that this is McCarthy talking about himself and what he is trying to achieve in his own writing craft: “I’ve looked at barns and houses and bridges and factories and chimneys and walls and in a thousand structures I’ve never seen a misplaced stone. In form and design and scale and structure and proportion I’ve yet to see an example of the old work that was not perfectly executed. They were designed by the men who built them and their design rose out of necessity. The beauty of those structures would appear to be just a sort of a by-product, something fortuitous, but of course it is not. The aim of the mason was to make the wall stand up and that was his purpose in its entirety. The beauty of the stonework is simply a reflection of the purity of the mason’s intention. Carly says I have this mystique thing about stonemasonry. She says nobody understands it. Even my father thinks its crazy. She says no one knows what I’m talking about. She says no one cares. In all his of course she’s right. And she says you cant change history and that ruins should be left to ruin. And she’s right. But that the craft of stonemasonry should be allowed to vanish from this world is just not negotiable for me. Somewhere there is someone who wants to know. Nor will I have to seek him out. He’ll find me.” Yes, I’ve found you Cormac. p. 111, Ben’s father has died by his own hand, and his anger and regret and is fresh and overwhelming, as he had judged his father harshly and missed his presence in life entirely: “Because I thought of my father in death more than I ever did in life. And think of him yet. The weight of the dead makes a great burden in this world. And I know all of him that I will ever know. Why could he not see the worth of that which had put aside and the poverty of all he hungered for? Why could he not see that he too was blest? … I lost my way. I’d thought by my labors to stand outside of that true bend of gravity which is the world’ pain.” Those of us with father’s, let us celebrate them, or reconcile with them, but do not ignore or hide from them. "What must be kept in mind is that the performance consists of two separate presentations. One is the staged drama. The other is the monologue - or - chautauqua - which Ben delivers from the podium. And while it is true that Ben at his podium is at times speaking for - or through - his silent double on stage, it is nevertheless a crucial feature of the play that there be no suggestion of communication between these worlds. In this sense it would not even be incorrect to assume that Ben is unaware of the staged drama. Above all we must resist the temptation to see the drama as something being presented by the speaker at his lectern, for to do so is to defraud the drama of its right autonomy. One could say that the play is an artifact of history to which the audience is made privy, yet if the speaker at his podium apostrophizes the figures in that history it is only as they reside in his memory. It is this which dictates the use of the podium. It locates Ben in a separate space and isolates that space from the world of the drama on stage. The speaker has an agenda which centers upon his own exoneration, his own salvation. The events which unfold upon the stage will not at all times support him. The audience may perhaps be also a jury. And now we can begin. As the mathematician Gauss said to his contemporaries: Go forward and faith will come to you." I have been so desperate for McCarthy's work that, having read all his novels, I am now reading his plays. The Stonemason is another powerful piece by Cormack telling the story of 4 generations of family members dwelling and working together and their eventual decline and loss. Starting with Pawpa, the 102 year old patriarch and cornerstone of the family, the family structure slowly crumbles, leaving us with a picture of humanity like only McCarthy can portray. Made me wish I worked with my hands and not a keyboard. That's the beauty of a book: It can change even the idea you have of yourself. A beautiful play about four generations of family, stones, masonry, God, pain and suffering. Maybe it's just because of my health, but this really worked for me. It is a rather lovely story that I only wish had been novelized rather than given the play treatment. One left (a screenplay!) for complete-o-rama of the 'Mac. The play has a guileless core and a sweetness to it that is hard to not admire. Written before McCarthy went Full Cowboy, this belongs to the Suttree side of the corpus. Skip The Sunset Limited and proceed directly here. Now can I get a show of hands in agreement that Cor Maybe it's just because of my health, but this really worked for me. It is a rather lovely story that I only wish had been novelized rather than given the play treatment. One left (a screenplay!) for complete-o-rama of the 'Mac. The play has a guileless core and a sweetness to it that is hard to not admire. Written before McCarthy went Full Cowboy, this belongs to the Suttree side of the corpus. Skip The Sunset Limited and proceed directly here. This play focuses on an African-American family living in Louisville in the 1970's. The emphasis is on the relationship between a young man (Ben) and his grandfather, a master stonemason. This is a quiet, contemplative work, with much of the action occurring offscreen as Ben sits quietly in the family kitchen, thinking or talking with relatives. According to Wikipedia, this play is rarely performed, and I don't necessarily find that surprising. I'm not quite sure how it would work as a performanc This play focuses on an African-American family living in Louisville in the 1970's. The emphasis is on the relationship between a young man (Ben) and his grandfather, a master stonemason. This is a quiet, contemplative work, with much of the action occurring offscreen as Ben sits quietly in the family kitchen, thinking or talking with relatives. A powerful play of the black experience that belongs in the same conversation as A Raisin in the Sun and Fences. McCarthy's powerful language is on full display here with no epic descriptions in which to hide, and it succeeds masterfully. Ben is a tragic character, one of those idealistic good guys who thinks he can help everyone yet winds up arguably doing more harm. His grandfather, Papaw (Pap-paw) is a fascinating man; Ben heeding his wisdom and both Big Ben and Soldier ignoring it makes for A powerful play of the black experience that belongs in the same conversation as A Raisin in the Sun and Fences. McCarthy's powerful language is on full display here with no epic descriptions in which to hide, and it succeeds masterfully. It is an easy trap to fall into to assume whenever a writer tells a story centered around a character's relationship with a trade that they are actually talking about writing. I can't say to a certainty that this was McCarthy's intent with The Stone Mason, and perhaps the early derision of Marx is meant to distance it from such an interpretation, but having read it through that lens, I felt that this play was a more profound reflection on the spiritual nature of that true vocational calling (see It is an easy trap to fall into to assume whenever a writer tells a story centered around a character's relationship with a trade that they are actually talking about writing. I can't say to a certainty that this was McCarthy's intent with The Stone Mason, and perhaps the early derision of Marx is meant to distance it from such an interpretation, but having read it through that lens, I felt that this play was a more profound reflection on the spiritual nature of that true vocational calling (seen through the analogue of masonry) than any other book written whether directly or obliquely on writing or artistic passion in general. Ben's Monologues are awesome in a way that does justice to the original and undegraded intent behind a word so worn out by the erosion of its thoughtless use. The characters are full, diverse, and human. The setting is specific in time and place and carries with it the warm, somber nostalgia of itself and yet is universal as all timeless works must be. After the 2011 HBO production of his play The Sunset Limited and last year’s Hollywood film of his script The Counselor, Cormac McCarthy’s work as a playwright began to intrigue me. Known more for his description-laden prose, McCarthy (arguably one of the most important American authors of the late 20th century) doesn’t at first blush seem like the kind of guy who could pare his style down enough for the stage. Clearly, though, he is fascinated by drama. He was likely inspired by director Richar After the 2011 HBO production of his play The Sunset Limited and last year’s Hollywood film of his script The Counselor, Cormac McCarthy’s work as a playwright began to intrigue me. Known more for his description-laden prose, McCarthy (arguably one of the most important American authors of the late 20th century) doesn’t at first blush seem like the kind of guy who could pare his style down enough for the stage. Clearly, though, he is fascinated by drama. He was likely inspired by director Richard Pearce, who approached him in 1974 to write the script for an episode of the PBS series Visions. The resulting two-hour episode, which aired in 1977, secured an Emmy nomination for McCarthy. The only other work in this genre he has produced is the 1995 play The Stonemason. Set in Louisville, Kentucky, in the 1970s, this five-act tragedy centers on the Telfairs, a family of stonemasons. The protagonist in Ben, who has abandoned his college studies of psychology to apprentice himself to Papaw, his grandfather, who even at the age of 101 continues to practice “the trade” with the younger man. The two live in the house of Ben’s father, who runs the family stonemasonry business. With them reside Ben’s wife, mother and sister, single mom to Soldier, a troubled teen. While the plot nominally follows various problems that threaten to tear the family apart, the core of the play is the relationship between grandfather and grandson. While many critics focus on the unusual monologues given by Ben while the actor’s double carries out a sort of dumbshow, I was drawn more to the interactions between Ben and Papaw. The older man shares a unique vision of the world predicated on his fealty to the craft. Stonemasons, differently than other stone workers, pull stone directly from the ground where they work and set those undressed stones, whole and unhewn, using mortar when needed, but seeking to use gravity and physics ("the warp of the world") to hold masonry in place. Papaw implies that this is the true will of God and that human attempts to chisel the world into other shapes are doomed to fail, being effaced by time and tragedy (a major theme of all of McCarthy's work). The blows to the Telfairs arise from their betrayals of the family trade and from Ben's insistence on trying to control and reshape the lives of his loved ones. Tellingly, though a fine stone mason, Ben violates the journeyman code that insists a man complete the work that can be done during the course of a normal day, leaving for the morrow the work that remains. Arrogantly or anxiously, he wants to get things done as quickly as possible. The Stonemason is an interesting play about a black family in the States. The Telfairs are about to undergo an unavoidable, unpredictable series of catastrophes (like many of Cormac McCarthy's main characters do). Confession: I wouldn't have picked this up if I wasn't working through every piece of Cormac McCarthy writing ever. This was the last thing left to read before I finish his oeuvre with the novel Suttree. Screenplays or short works haven't been the highlights of this project, as McCarthy The Stonemason is an interesting play about a black family in the States. The Telfairs are about to undergo an unavoidable, unpredictable series of catastrophes (like many of Cormac McCarthy's main characters do). Confession: I wouldn't have picked this up if I wasn't working through every piece of Cormac McCarthy writing ever. This was the last thing left to read before I finish his oeuvre with the novel Suttree. Screenplays or short works haven't been the highlights of this project, as McCarthy is at his best when he gets grandiose and epic, and there's often just not enough time. Sub-par McCarthy is still tremendously interesting and well-written, but I still went into this with tempered expectations. In theme, this was similar to many of McCarthy's works: the degradation of traditional life, the value of physical work, all with death looming over every moment. The perspective of a black family means issues of race and time are at the forefront here: the more abstract, mental pains of the new age are contrasted with the physical oppression old, so societal progress is presented more evenly than in, say, No Country For Old Men. A great, passionate play on grief set in my own town of Louisville, KY. It's an emotional, occasionally devastating read. Some of the stage directions were a little funky. And play-writing isn't McCarthy's strong-suit but it's a pretty damn good play. A stone just feels heavy yet soft when holding it. When chucked at your head however, it could possibly concuss or kill you. Same goes for this play, but double. Taking place in Louisville, Kentucky in the 1970s, this play follows the Telfair family over the course of a few years as they navigate various family events - birth, death, struggles with money. The protagonist, Ben Telfair, shares his views in monologues peppered throughout the play. But while some reviewers liked these monologues, I actually found them distracting and would quickly read through them to get back to the action at hand, which was simply following what happens to this struggling Taking place in Louisville, Kentucky in the 1970s, this play follows the Telfair family over the course of a few years as they navigate various family events - birth, death, struggles with money. The protagonist, Ben Telfair, shares his views in monologues peppered throughout the play. But while some reviewers liked these monologues, I actually found them distracting and would quickly read through them to get back to the action at hand, which was simply following what happens to this struggling family over the course of a few years. While we were commissioned with following Ben Telfair on this journey, I actually found two other characters more intriguing. Rather, it is Ben’s relationships with, interactions with, and observations of both Papaw and Soldier that give the story its meat and kept me reading. Papaw, the titular Stonemason, is the character who is the soul of this play, more so than any other character, while Soldier is the character who represents the reality of the changing times and the ensuing struggles they could potentially face in the decades to come. And that is what I was left with: What happened to the Telfair family since the end of the 1970s? Did Ben Telfair go back to college and finish his degree in psychology or did he continue as a stonemason, taking his grandfather’s trade with him into the following decades? Aside from the questions I was left with, I also found myself thinking about how nicely McCarthy set up the dichotomy between Papaw and Soldier, who represented the changing times of the generations. Eight decades or so separated these two male characters and Ben represents the struggle between the two -- the yearning for the “simpler” times versus the need to adapt to more complex and changing social times. Ultimately, I came away with from this play knowing that the Telfairs probably continued to struggle in the following decades, but still hoped that maybe they hadn’t, that maybe they found peace, prosperity, and a simpler, easier life. Cause the unjust have the just's umbrellas. In my dream I had died or the world had ended and I stood waiting before the door of some ultimate justice which I knew would open for me. I stood with my job-book beneath my arm in which were logged the hours and the days and the years and wherein was ledgered down each sack of mortar and each perch of stone and I stood alone in that whitened forecourt beyond which waited the God of all being and I stood in the full folly of my own righteousness and I took the book from under my arm and I thumbed through it a final time as if to reassure myself and when I did I saw that the pages were yellowed and crumbling and the ink faded and the accounts no longer clear and suddenly I thought to myself fool fool do you not see what will be asked of you? How He will lean down perhaps the better to see you, regarding perhaps with something akin to wonder that which is his own handiwork, He whom the firmament itself has not power to puzzle. Gazing into your soul beyond bone or flesh to its uttermost nativity in stone and star and in the unformed magma at the core of creation. And ask as you stand there alone with your book—perhaps not even unkindly—this single question: Where are the others? Where are the others. Oh I've had time in great abundance to reflect upon that terrible question. Because we cannot save ourselves unless we save all ourselves. I had the dream but did not heed it. And so I lost my way. I had high hopes for this short play, which actually feels rather longish, owing to the lengthy stage directions. Alas, it did not live up to expectations. While there are some good things about this piece, including characters I wanted to like, the writing quality was surprisingly lacking. There are some truly odd lines in here, including such clunkers as, 'The Semetic God was a god of the common man and that is why he'll have no hewn stones on his altar.' It feels strange to say I thought the I had high hopes for this short play, which actually feels rather longish, owing to the lengthy stage directions. Alas, it did not live up to expectations. While there are some good things about this piece, including characters I wanted to like, the writing quality was surprisingly lacking. There are some truly odd lines in here, including such clunkers as, 'The Semetic God was a god of the common man and that is why he'll have no hewn stones on his altar.' It feels strange to say I thought the writing in a work by Cormac McCarthy was...not very good, but it could've been better. My other issues have to do with the idea that these characters don't feel entirely genuine or well fleshed out. I felt the dialogue was clumsy at times. 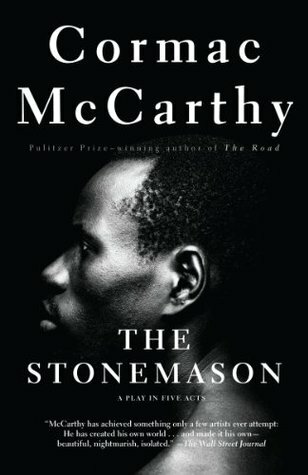 Eventually, I began to feel as uncomfortable reading this play as I did while reading Kathryn Stockett's The Help, particularly because of the way McCarthy attempts to represent stonemasonry as a clumsy metaphor for freedom in the lives of black characters frustrated by racism and financial distress. That seemed hackneyed and obvious to me. I hope CM's screenplay is better than this. I saw Cormac McCarthy's only play in the library and though I felt like I should read more of his novels first I decided to borrow it anyway to better motivate me to pay more attention to a writer I have no real excuse to ignore like I have since I read Blood Meridian. As far as plays go, this play meets all my criteria for five stars. Though I prefer plays with a little more excitement there is really no other complaint a sensible person can make against this five act drama. It has depth, capti I saw Cormac McCarthy's only play in the library and though I felt like I should read more of his novels first I decided to borrow it anyway to better motivate me to pay more attention to a writer I have no real excuse to ignore like I have since I read Blood Meridian. As far as plays go, this play meets all my criteria for five stars. Though I prefer plays with a little more excitement there is really no other complaint a sensible person can make against this five act drama. It has depth, captivating characters that I'm sure would be three times more so in a theater performance and, most impressively in my opinion, it is a splendid fusion of McCarthy's old time vocab with the modern day (well with the early 70's anyway). All the characters are black and there are a few civil rights related themes throughout. But those who try to read this for that purpose only risk losing out on a story that is about much more. It is about family, it is about the division of family and is perhaps the most moving testimony to the stonemason craft that has ever been put to paper outside of whatever secretive texts the freemasons might have stashed away. My first thoughts with the book was "this is not McCarthy." Assuredly, it's not him at his norm but his style is very apparent as the play goes. Unusual for his style in that this is way more openly poetic and philosophical than anything I have known by him. Not that McCarthy (an American genius) ever lacked such qualities, but through the voice of Ben you get it up close and personal. Fantastic. I'd love to see this performed. Silver and I read this one aloud. It tore me apart, unsurprisingly (Cormac McCarthy has a way of doing that to me). Completely unfeasible to put on stage (although it was attempted, once, with large alterations from what I understand) but I think of it (like The Sunset Limited) as more of a book in play form. McCarthy's characterizations are extremely human, and extremely believable, which makes it hurt so much more to read it.